Gerard Depardieu stars as Germain, a lumbering yet kindhearted illiterate brute who is more at home talking to the pigeons in the park than the mean-spirited residents of his small French town. He lives in a trailer in his eccentric mother’s yard and spends his free time in a local bar that is filled with typically quirky, fast-talking French-types. While counting pigeons one day, Germain meets Margueritte (97-year-old actress Gisele Casadesus), a well-read elderly woman who identifies with the harmless stranger’s loneliness and isolation. A unique kind of love soon blossoms between them as Germain’s repressed educational desires blossom anew in a manner that will surely warm the hearts of those that appreciate sincerity. The film is light on both narrative and length (82 minutes though the end credits start rolling at the 78 minute mark), but its emotions are honest and true. Flashbacks to Germain’s youth reveal an overbearing teacher and a mother driven to cruelty, obstacles from the past that will have to be overcome if Germain is to reach his true potential. He does so with the help of Margueritte in a manner that will seem sickeningly shameless to some, sweetly satisfying to others, and undeniably French to all. 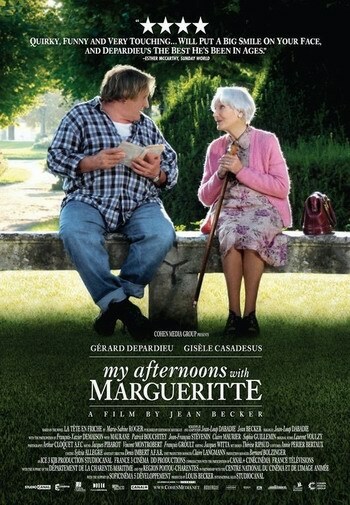 My Afternoons with Margueritte opens today at the Ritz Five.